The CDM-VW300 is a 2-channel interface between vibrating wire sensors and dataloggers that allows shorter intervals between measurements. This allows the same sensors used for static monitoring to also be used for sub-second dynamic monitoring. The analyser greatly reduces noise that often occurs with the use of vibrating-wire sensors. It allows the signal to carry through longer cables, giving flexibility in sensor and datalogger siting. 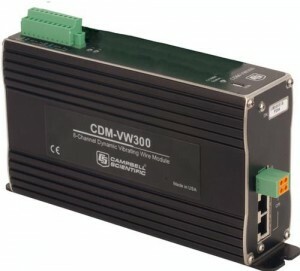 The analyzer allows high data rates, and multiple CDM-VW300 modules can be connected to one datalogger. The CDM-VW305 is similar to this item, but has 8 channels. The CDM-VW300/305 also simplifies post-processing of data by computing common values internally. Vibrating-wire data is reported as measured frequency or as the frequency squared with a multiplier and offset applied. The thermistor data is reported as resistance or is converted to degrees Celsius using the thermistor's Steinhart-Hart coefficients. The CDM-VW300 also can internally compile rainflow histograms of the final data, and report the values at user-specified intervals with a high degree of configurability in the histogram format. The CDM-AVW300/305 can be used with the CR800, CR1000 or CR3000. It requires the addition of the SC-CPI module with these loggers.